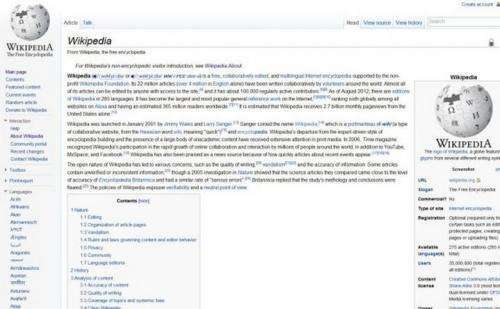 The Wikipedia paradox: Who's telling the truth? People are less likely to trust a poorly written article if the visual cues suggest it comes from Wikipedia. Presented with the same information in an alternative layout, their trust will be greater. The presence of serious factual errors has little or no effect on the trust placed in a Wikipedia article, even among experts on the subject in question. People who take a negative view of Wikipedia are less good at estimating whether an individual article is trustworthy or not. These are among the findings of the doctoral research carried out by Teun Lucassen at the University of Twente's CTIT research institute. Lucassen investigated how internet users assess the reliability of online information. He will defend his doctoral dissertation on 1 March. Before the advent of the internet, the situation was clearer: information that appeared in print was likely to be correct because it had been checked by an editor or a journalist. But in the age of the worldwide web, anyone can easily publish all kinds of information online, leaving the user with the challenge of determining how reliable it is. In his doctoral research, Teun Lucassen investigated how users go about assessing the reliability of the information they find online. In doing so, he focused primarily on the widely consulted online encyclopaedia Wikipedia. Lucassen believes it is a particularly good place to start because of what he calls the 'Wikipedia Paradox': everyone knows that the information on Wikipedia is generally of high quality, but because of its open structure, you can never be entirely sure of the reliability of individual articles. In several smaller-scale studies, in which he manipulated Wikipedia articles, Lucassen looked at how users assess reliability. His PhD research resulted in a new scientific paradigm: the 3S model of trust in information. On the basis of personal user characteristics – domain expertise, information skills and familiarity with the source – the model describes how users assess the reliability of individual articles. The three S's of the model stand for semantic features (the content), surface features (how information is presented, i.e. images and references) and source features (characteristics of the source, in this study usually Wikipedia). The study shows that everyone, depending on their personal profile, uses these aspects to assess the reliability of information. However, the extent to which they use each aspect depends very much on the three personal characteristics. For example, a user with less expertise on a given topic will place greater emphasis on how the information is presented and its source. Teun Lucassen conducted his PhD research at the CTIT research institute and the Department of Cognitive Psychology and Ergonomics at the University of Twente. One can always check out the history of any wiki-article. If any modification has been done recently, I trust it less. Which seems intuitive. After all: you go to the article to get some information on the subject you know (too) little about. So why would anyone expect that such a person could even spot factual errors? everyone knows that the information on Wikipedia is generally of high quality, but because of its open structure, you can never be entirely sure of the reliability of individual articles. To be fair: the same thing goes for print media. I do remember someone checking Encyclopedia Britannica (when there was still a print edition) vs. Wikipedia - and the number of severe/factual errors per article was roughly the same. Currently the Wikipedia is rather conservative source of information, which is essentially correct because of its name. Several years ago, one William Connolloy, with connections to East Anglia, was the sole editor there in charge of everything remotely connected to AGW. He personnally edited over 5,000 pages, deleted many others if they disagreed with his beliefs on the subject, and banned dozens of contributors if they weren't 100% on board with Global Climate Distruption (or whatever they're calling it this week.) The firestorm when this was discovered resulted in his being banned from Wiki. During the run-up to the 2008 election, every page related to Obama and his very questionable associations was scrubbed of anything negative, and this editing is ongoing. Pages concerning conservatives are routinely filled with slime by leftists. Conservative means consistent with mainstream opinion here - not traditional or liberal in political sense. But we apparently need a similarly structured database of all insights and ideas, unverified or forgotten experiments and thoughts, which would not only help the people in learning of well established facts, but it even helped them and motivate them in following of new perspective ideas. We have that Zeph, it's called the Internet. Ya can access all the crank, crackpot, and pseudoscience ya could possibly read in one lifetime. By the By: It comes with a very efficient search feature,,, I think it goes by the name "Google", but I could be mistaken, it might be called "Yahoo". But don't take my word for it,,,, just type "Aether" into it and see the unlimited amount of source material for your ducks and waves ya'll find. Such a database would indeed require a quite different contribution and moderation policy. The Internet thingy I just told ya about? Well it does have a different contribution and moderation policy. We found ya, right?